Voll im erwarteten Trend? Josef Kowatsch hat sich die Temperaturreihe für die letzten 30 Jahre angeschaut und förderte Überraschendes zutage: Der Trend der März-Temperaturen ist leicht negativ, abkühlend! War dies wirklich erwartet worden? Abb. 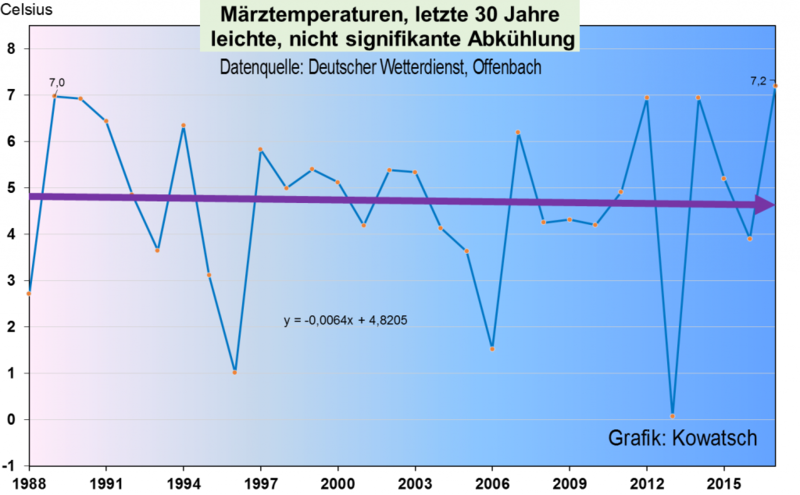 1: Entwicklung der März-Temperaturen in Deutschland während der letzten 30 Jahre. Daten: DWD, Graphik: Josef Kowatsch. Abb. 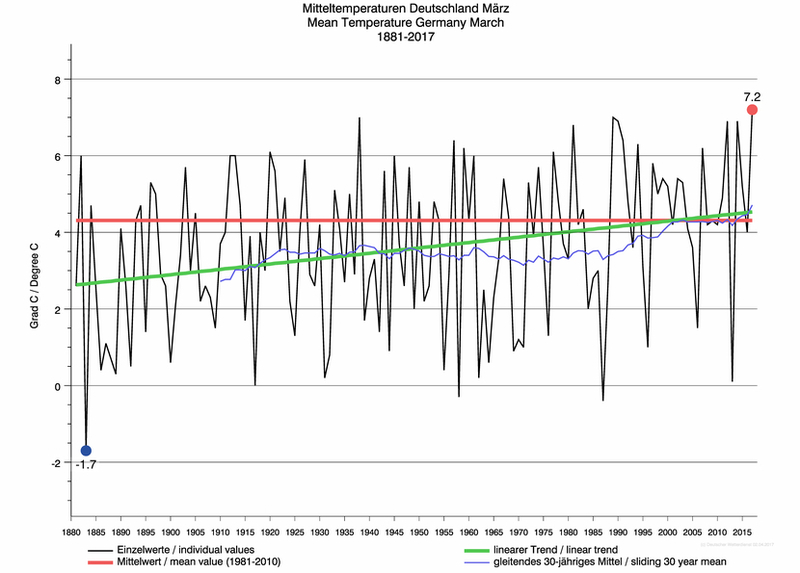 2: Entwicklung der März-Temperaturen in Deutschland während der letzten 135 Jahre. Daten und Graphik: DWD. The speed at which a tiny ant evolves to cope to its warming city environment suggests that some species may evolve quickly enough to survive, or even thrive, in the warmer temperatures found within cities, according to a new study by researchers at Case Western Reserve University. Evolution is often thought of as a process that takes millennia, but urban acorn ants collected in Cleveland have taken no more than 100 years to adjust to their heat-trapping home of asphalt and concrete steeped with waste heat from cars and buildings–although their tolerance to cold was reduced. The researchers’ findings are published online in the Biological Journal of the Linnean Society. “Ants are an indicator species, and by comparing the physiologies of urban versus rural ants, we can get an idea of whether ants and other cold-blooded animals will be able to cope with the temperature changes associated with urbanization and other sources of warming like global climate change,” said Sarah Diamond, assistant professor of biology at Case Western Reserve and the study’s lead author. Diamond worked with Ryan Martin, assistant professor of biology, research associates Lacy Chick and Stephanie Strickler, and PhD student Abe Perez. Cities tend to be a couple of degrees warmer than surrounding rural areas. To determine whether animals evolve or simply adjust to added warmth, the research team collected and compared acorn ants from the city and nearby rural land. The acorn ant (Temnothorax curvispinosus) is widespread and important for decomposing organic material in urban and rural environments across the United States. This species of ant is smaller than a cookie crumb; an entire colony of 250 can fit in a single acorn. The researchers collected colonies from within the city of Cleveland and as far as 28 miles east from the Holden Arboretum in suburban Kirtland, Ohio, to study in Diamond’s lab. To isolate evolutionary change from short-term acclimation, groups of rural and city ants were raised in warmer city temperatures for about 10 weeks. Other groups from both locations were raised in cooler rural temperatures for 10 weeks. Tests of thermal tolerance showed all the ants acclimated. “They’re very plastic,” Martin said. “But ants collected from city habitats retained their higher heat tolerance and loss of cold tolerance compared to rural ants, regardless of whether they were born and reared under warm or cool temperatures.” Martin and Diamond believe the Cleveland ants evolved as the city became and remained highly urban during the last 100 years. Because egg-laying queen ants live from five to 15 years, the evolution to heat tolerance likely took no more than 20 generations, the researchers estimated. With temperatures predicted to rise at least a couple of degrees Celsius over the next century, “Global data suggests that the acclimation response won’t be enough to respond to climate change, but some species, like the acorn ants, may evolve quickly enough,” Diamond said. The researchers suggest this experiment can be repeated with other species in cities around the world. Whether other species can adapt as rapidly to cities and other sources of temperature change is unknown but remains an important question for researchers trying to predict what future biological communities will look like and how they will function, Diamond and Martin said.